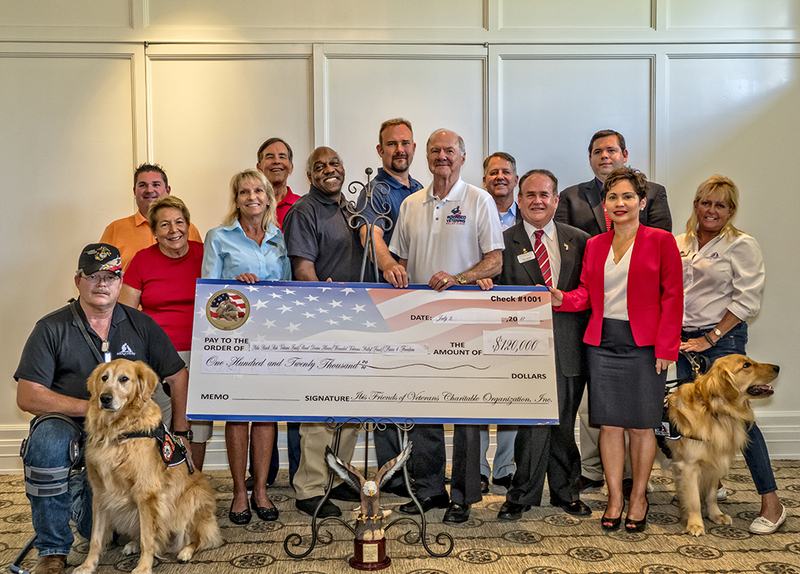 The Ibis Friends of Veterans Charitable Organization, Inc. has donated $120,000 to support veterans at four local organizations including the Palm Beach State College Foundation. The funds were divided among the groups, with Palm Beach State receiving $40,000. This is the third year in a row that Ibis Friends of Veterans has donated to student veterans at the College, with this year’s donation the highest to date. In 2016, the group donated $35,000 and in 2015 $25,000. Other organizations who received funds were: Stand Down House, Wounded Veterans Relief Fund and Paws 4 Freedom. The Palm Beach State funds, presented earlier this week at the Ibis Golf & Country Club, will go toward student veteran scholarships, book stipends and club events on all campuses. The College has centers for veterans on the Palm Beach Gardens, Lake Worth and Boca Raton campuses. According to President Bill Emerson, the mission of Ibis Friends of Veterans is to raise funds for local charitable organizations who support returning veterans and who have very low overhead. This year’s donation brings their five-year total of giving to local veteran groups to over $400,000. “It is our honor to support the men and women who have paid a high price to protect our freedom, ” said Emerson. The $120,000 was collected from the Ibis Friends of Veterans Charitable Organization’s annual golf tournament held earlier this year. The Ibis Friends of Veterans was established in 2012 by Bruce Gamradt and other veteran supporters residing in Ibis Golf & Country Club. This is so wonderful! I am so proud of our Veteran students who are relentless in continuing their path to success. Thank you for all your sacrifices–our veterans and their families. Thank you, Ibis Friends of Veterans. That is so generous. Medical Assisting Program assists collections for the Forgotten Soldiers Outreach during the year. Our Veteran students are very successful in their careers. when does Palm Beach State volunteer and where at American Red Cross BP and blood events? the drive to support our patients.